Andersonville Dental, your neighborhood dental office has been serving the Andersonville community for more than 15 years. Dr Anita Shahin, an Andersonville dentist, and the staff at Andersonville Dental promise superior customer service, brand new digital dental equipment, and the expertise and precision you would expect. 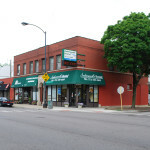 Our Andersonville dental office is conveniently located on Foster Avenue in Chicago. There is always street parking available. Public transportation is also available for our patients and staff. Andersonville Dental welcomes patients of all ages. We have morning, evening and Saturday appointments to fit every schedule. We accept cash, credit cards, personal checks, PPO dental insurance and traditional indemnity insurance. We have affordable pricing and offer our patients the 6-month 0% financing option with CareCredit. Our dental practice is family friendly. We are always accepting new patients. We also invite patients who have a dental emergency to call Andersonville Dental. We treat emergencies promptly during business hours. Please call (773) 334-4200 at your convenience to make your appointment.